It took the final weekend, but the Detroit Red Wings and Philadelphia Flyers fought their way into the NHL playoffs field of 16. However, the two squads have an uphill climb to reach the Stanley Cup Final. 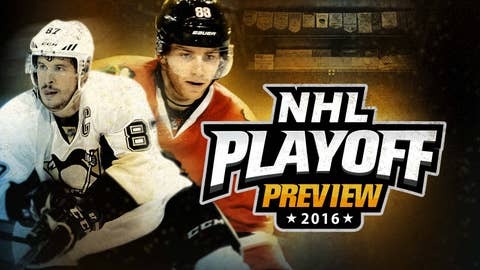 WhatIfSports simulated the NHL playoff bracket 1,001 times using the current season rosters and statistics. Home-ice advantage is taken into account. 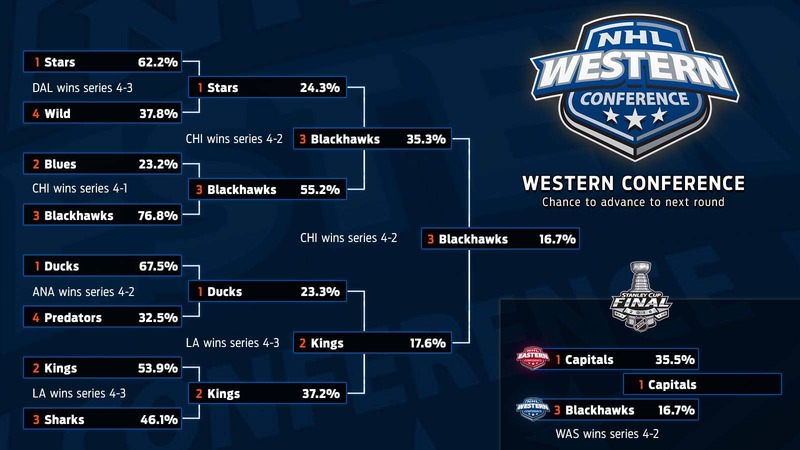 Opening round win percentages are indicated in the bracket graphics below. Because future round matchups may vary, the simulation engine provides each team’s – who advance out of the first round – odds of advancing further into the playoffs. For example, the Washington Capitals have a 95.7 percent chance of advancing out of the first round and a 72.4 percent chance of reaching the conference finals. The table below illustrates each team’s chances of advancing to the next round and/or winning the 2016 Stanley Cup. 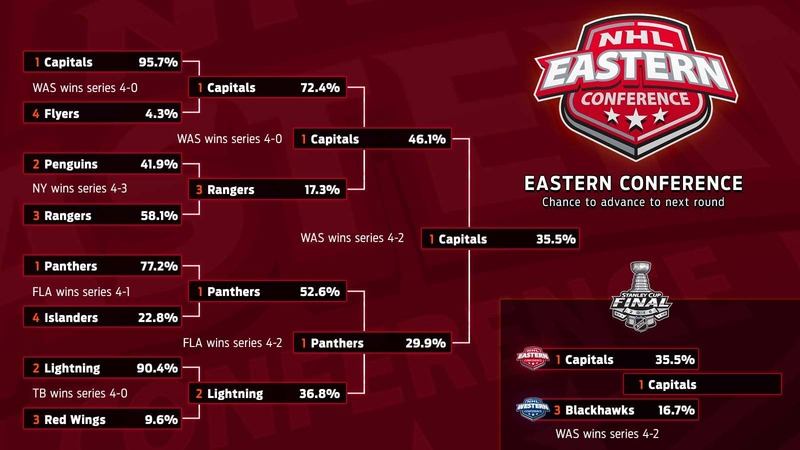 After 1,001 simulations of the 2016 NHL Playoff bracket, the WhatIfSports NHL simulation engine favors the Washington Capitals to raise Lord Stanley’s Cup. The Florida Panthers and Chicago Blackhawks have the next best odds of winning the Cup before a dramatic statistical probability is reached. REGULAR SEASON: Capitals went 56-18-8 (120 points) to win Metropolitan Division and Presidents’ Trophy. Flyers went 41-27-14 (96 points) to get second wild-card spot. SEASON SERIES: Capitals won 2-0-2, with two wins in regulation. STORY LINE: The Capitals clinched the Presidents’ Trophy two weeks ago, though they struggled to get into playoff mode by losing five of their final seven games with nothing at stake. Goalie Braden Holtby is in a groove, and the skill at center and on the wings is tough to top. This ought to be a bruising opener, though, against a Flyers team that finished coach Dave Hakstol’s first season 15-5-3. Rallying behind Claude Giroux and Wayne Simmonds, they rose from 12th place in the Eastern Conference to reach the playoffs on the second-to-last day of the schedule. REGULAR SEASON: Panthers went 47-26-9 (103 points) to win Atlantic Division. Islanders went 45-27-10 (100 points) to get second wild-card spot. SEASON SERIES: Panthers won 2-1, with one win in regulation. STORY LINE: The long-languishing Panthers have reached the playoffs for only the fifth time in the franchise’s 22 seasons, still without a series win since the 1996 run to the Stanley Cup finals. They’re fueled by unique mix of young (Aaron Ekblad,Jonathan Huberdeau, Aleksander Barkov) and old (Jaromir Jagr, Roberto Luongo,Brian Campbell). The Islanders had a solid first season in Brooklyn, reaching the playoffs for the third time in four years behind John Tavares and Kyle Okposo, the leaders of a talented young forwards corps. They’ve dealt with lots of injuries down the stretch, but defensemen Travis Hamonic should be back for the start of the series. REGULAR SEASON: Penguins went 48-26-8 (104 points) to finish second in Metropolitan Division. Rangers went 46-27-9 (101 points) to finish third in Metropolitan Division. SEASON SERIES: Penguins won 3-1, with two wins in regulation. STORY LINE: The Penguins, who’ve won four total playoff series over the last six years since winning the Stanley Cup in 2009, have lost seven of their last eight postseason games against the Rangers and were ousted by them each of the last two years. But they’ve been on quite the roll. The Rangers are still stacked with experience and talent from the last two seasons that have ended in the Stanley Cup finals and Eastern Conference finals, respectively. REGULAR SEASON: Lightning went 46-31-5 (97 points) to finish second in Atlantic Division. Red Wings went 41-30-11 (93 points) to finish third in Atlantic Division. STORY LINE: With center Steven Stamkos out because of a blood clot and defenseman Anton Stralman absent due to a broken leg, the Lightning stumbled down the stretch but still managed to snag home-ice advantage for the first round. The Red Wings have reached the playoffs for the 25th straight year to stage this rematch of last year’s Eastern Conference quarterfinals. REGULAR SEASON: Stars went 50-23-9 (109 points) to win Central Division and Western Conference. Wild went 38-33-11 (87 points) to get second wild-card spot. SEASON SERIES: Stars won 4-1, with one win in regulation. STORY LINE: The Stars are in the playoffs for just the second time in the past eight years, the top seed for the first time since 2003. All-Star forward Tyler Seguin’s status is uncertain after he missed most of the last month with a cut on his left Achilles tendon, but this is a high-powered team that led the league during the regular season with 267 goals. The Wild, facing the franchise that used to call Minnesota home for the first time in the playoffs, have the worst record of a playoff team since the shootout era started in 2005. They’re hurting, with forwards Zach Parise and Thomas Vanek iffy for the series. REGULAR SEASON: Ducks went 46-25-11 (103 points) to win Pacific Division. Predators went 41-27-14 (96 points) to get first wild-card spot. SEASON SERIES: Predators won 2-1, with two wins in regulation. STORY LINE: The Ducks have advanced one round further in each of the last three postseasons, only to lose Game 7 at home. Can they take the next step? They became the first team to lead the NHL in both power play and penalty kill since the 1984-85 Islanders. Filip Forsberg and James Neal topped 30 goals for the Predators, who have reached the playoffs for the ninth time in 12 seasons but have won only two series in that span. REGULAR SEASON: Blues went 49-24-9 (107 points) to finish second in Central Division. Blackhawks went 47-26-9 (103 points) to finish third in Central Division. SEASON SERIES: Blues won 3-2. STORY LINE: The Blues are coming off another strong regular season but have been stung by three consecutive first-round exits, including 2014 when they led Chicago 2-0 before losing four straight. They expect to be at full strength after weathering injuries to several key players, including both goalies, during the regular season. The defending Stanley Cup champion Blackhawks, who’ve taken the trophy in three of last six seasons, might not be as dominant as they’ve been recently. But they still have Patrick Kane, who finished with a career-high 46 goals and 60 assists for his first career Art Ross Trophy. REGULAR SEASON: Kings went 48-28-6 (102 points) to finish second in Pacific Division. Sharks went 46-30-6 (98 points) to finish third in Pacific Division. SEASON SERIES: Sharks won 3-1-1, with three wins in regulation. STORY LINE: Both teams are back in the postseason after missing out last year, meeting in the playoffs for the fourth time in the past six seasons. The Sharks won the first series in 2011. The Kings won in 2013 and 2014, when the Sharks became the fourth NHL team to lose a best-of-seven series after winning the first three games. That defeat lingered for an entire season, but San Jose is back with more depth and former Kings backup goalie Martin Jones leading the way. Whether a strong regular season translates into a third Stanley Cup in five seasons for a core Kings group that has always been better in the playoffs remains to be determined.